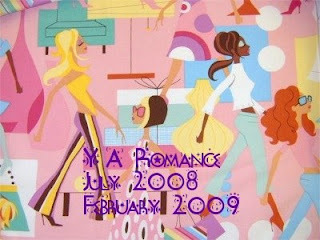 * Read six YA romance novels between July 1, 2008 and February 28, 2009. * Romance should be a strong element within the story. But it doesn't have to be the only element. Realistic fiction (contemporary). Historical. Fantasy. Science Fiction. Retold Fairy Tales. All genres are allowed. * They can be part of a series, or stand-alones. * They can be long or short. * Audio books are allowed. * Up to three movies can be substituted for books. So you could watch 3 movies, read 3 books if you prefer.